Achieving my #goals. I thought it was what life was about. I brought my goals into every meeting and every relationship. I was insufferable. Much later, I began to understand my values. See, most people only have goals some of the time. At other times they “wing it”. A person might go into a salary negotiation with a goal — a concrete outcome they hope to achieve — but when they’re casually chatting with their best friend, they just let the conversation drift. But even without a goal, they may still have ideas about how they want to be with their friend. They might want to be honest, or real, they might want to keep things light, and so on. Some ways you might approach a conversation. And even when a person does have a goal, they still have ways they want to approach it. Someone may want to be courageous in their salary negotiation, or fair-minded. When I’m biking to work, I want to get there at a certain time. But I also want to be present, to be embodied, to notice my sensations. Everything on the left is a concrete thing that could happen, a place to get to, a goal; everything on the right is a way of operating, an idea about how to proceed, a way of approaching situations, or other people, or life in general. In other words, values are the ways of doing things that matter in their own right to you, not for an external purpose. Your values are the ways of doing things that are meaningful to you in themselves. In general, we care even more about our values than our goals. 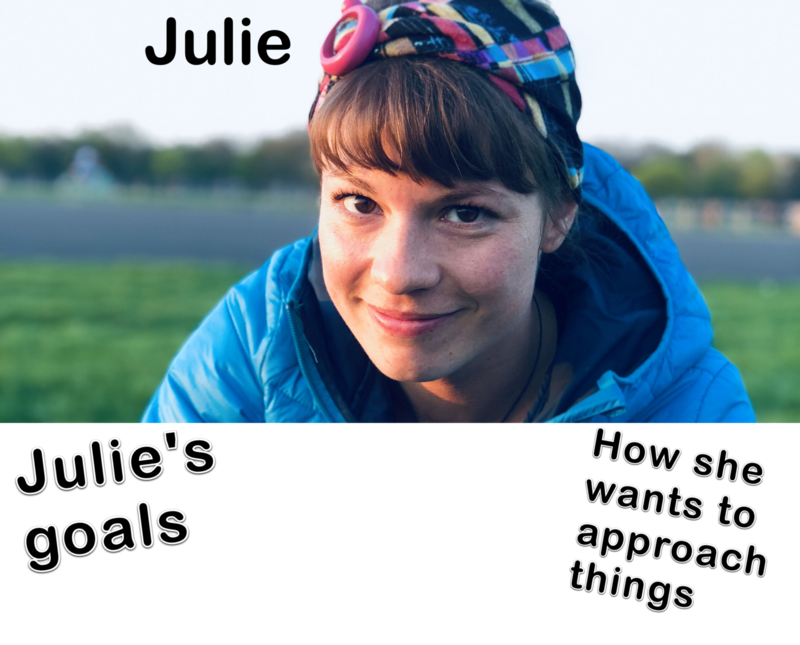 Julie achieves all of her goals, but in a manner that contradicts her values. So, she visits grandma, but not lovingly. She moves back to Berlin, but not in celebration of friends. She starts a company, but not in a courageous or clever way. Or, Julie could live by her values, but achieve none of her original goals. She never visits grandma—but instead does something loving for someone else (maybe someone else’s grandma). She doesn’t make it to Berlin—instead, she celebrates her friends differently (e.g., by throwing a series of surprise parties, or becoming a godparent). She doesn’t start a company—instead she finds another thing to do courageously and cleverly (perhaps she writes a book). Julie wouldn’t want to make this choice. She loses something either way. But my bet is that she’d pick option 2. Try making your own table. If you had to choose, which would you leave behind? Our values (our non-goal drives) are healthy, legitimate, and personally important. For most of us, they are more important than our goals. Goals can be named more precisely. The goals of friends, colleagues, and customers are more well-known. We know which products or websites help us with goals (booking a flight, buying a sofa), but it’s harder to name what helps us to live by our values. We often take steps towards our goals, but ignore a regress in living by our values. If our values are so important, why are they less well-understood? 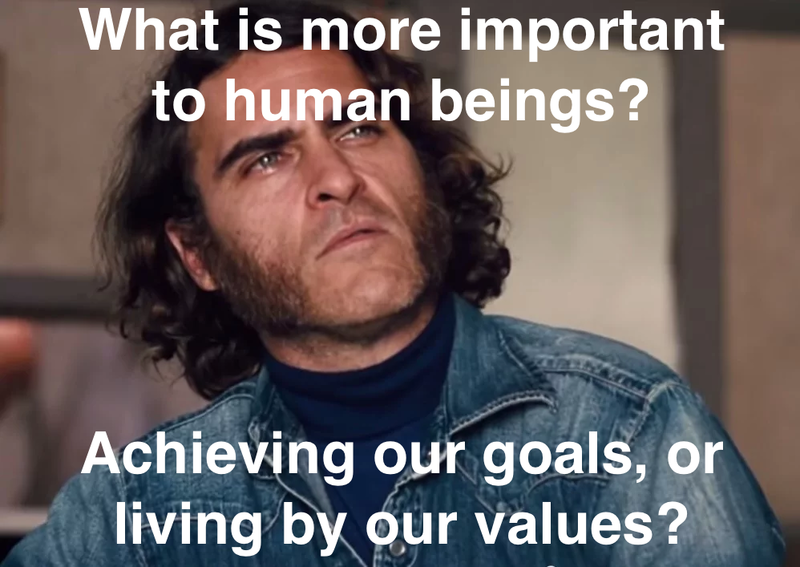 Some people think values are inherently vague, and less clear than goals. But that’s not true: after a little practice, people can learn to speak about values and goals with the same level of precision. In a future post, we’ll explore how this lack of clarity about values arose. For now, it’s enough to note that, despite the importance of our values, they are less well-understood. Because we are more aware of goals, we are also more aware of the goal-fulfillment parts of society. In my 20s, I thought that was the purpose of society. I thought it was all about collaborations, markets — the things that help people achieve their goals. But, as I mentioned in the first post, we need leaders who can build social structures that work with our values. As awareness of values—and of what it takes to live by them—spreads, better principles and systems will emerge. In the next part – Mottoes We Live By – I show how these basic kinds of self-awareness shape societies, and set out a plan for the Next Enlightenment. 1. The sixth post will cover three things which can appear in the “how” column: values, norms, and ideological commitments. 2. The understanding of values I present here comes from a certain philosophical tradition. If you want to go straight to the source, read David Velleman’s Practical Reflection and How We Get Along, and/or Charles Taylor’s Sources of the Self. If you want group exercises to get clear about your own values, check out HSC1. This short series, titled “The Next Enlightenment” presents new social principles, developed within a small community of technologists, game designers, sociologists, and spacemakers. Thanks to Sam Hammond, Albert Kong, Nathan Vanderpool, David Chapman, Kevin Simler, Andy Matuschak, Kathryn Hume, and Boris Smus for reviewing drafts.